Cuts on the fingers, hand, and wrist can injure the tendons that move the fingers. Sometimes these lacerations can seem relatively small on the outside but need to be carefully assessed if they seem to be affecting the motion of the fingers. Tendon lacerations are treated by Dr. Peter G. Fitzgibbons, MD at The Centers for Advanced Orthopaedics: Maryland Orthopedic Specialists Division, who is fellowship- trained in both orthopaedic trauma and hand surgery. 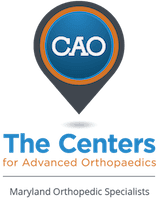 With locations in both Germantown and Bethesda, Maryland, he and a team of orthopaedists, hand therapists, and physical therapists offer a comprehensive range of services covering the diagnosis, treatment, and recovery from tendon injuries. What exactly are tendons and what happens when they get cut? Tendons are like ropes that connect muscles to bones and allow joints to move. If a tendon is cut completely in half, the ends will retract away from each other and the tendon won’t work anymore to move the joint. How are tendon lacerations treated? Tendons that are cut completely and not working need to be repaired with surgery in order to function again. The tendons ends are sewed back together, and then need to heal, which takes about a month. During that time, Stephanie Clement, our certified hand therapist, oversees the rehabilitation process, which usually involves carefully protected motion to avoid stiffness while at the same time allowing the tendon to heal appropriately. What is surgery like for a tendon laceration? Surgery for a tendon laceration is almost always an outpatient procedure and is done with either general or local anesthesia, depending on the circumstances. Dr. Fitzgibbons performs most of these procedures at the Massachusetts Avenue Surgery Center, an outpatient surgery center that provides a safe, patient-oriented experience in a friendly and comfortable environment.